Editor’s note: This is a breaking news story and has been updated with new information throughout. Black holes have evaded a real closeup for centuries, the elusive beasts of the universe slipping by unseen—until now. 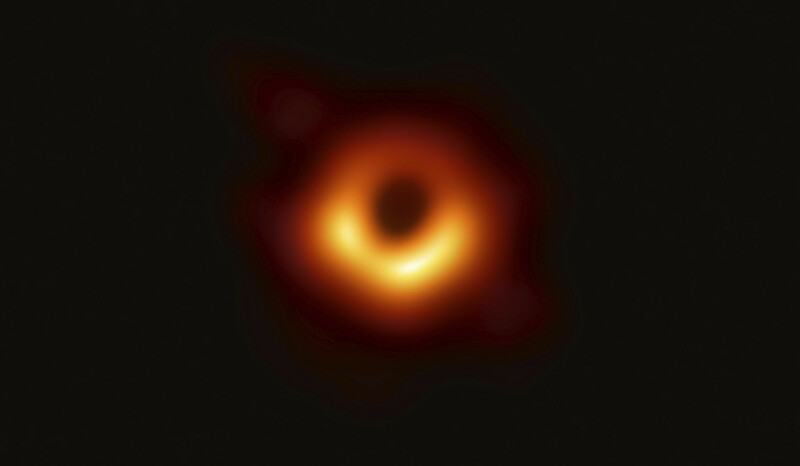 Today, the international team of the Event Horizon Telescope (EHT) released the first-ever image of a black hole darkened by the effects of the event horizon, the invisible boundary where nothing, not gas, dust, or even light, can escape its powerful gravitational grasp. The image is 20 years in the making. The high-angular resolution image—made up of many snapshots like a collage—depicts the 6 billion solar-mass black hole at the center of the galaxy Messier 87, or M87, some 55 million light years away. It reveals that the theorized event horizon, that inescapable pull at the membrane of the black hole, exists. And it backs up Albert Einstein’s theory of general relativity. “It’s basically like Interstellar [the film], except that for the first time we’re hoping to do it with data,” astrophysicist Feryal Özel, an Event Horizon Telescope team member stationed at the telescope arrays in Arizona, said to Science Friday in a phone interview before the Wednesday announcement. Past visualizations of black holes come from what researchers have simulated with data: A pit of darkness in the midst of a field of sparkling stars and galaxies; the blinding, ethereal accretion disk from the film Interstellar; or as Shep Doeleman explained in a 2012 Science Friday interview, “a rubber screen with a bowling ball in it that bends the rubber screen down.” But the image produced by the EHT reveals the shadow of the black hole—a soft ring of light illuminating an inky abyss. This glow indicates that the black hole is spinning. To achieve the resolution of the black hole’s event horizon, the team needed an enormous, powerful telescope, one with 2,000 times the magnifying power of the Hubble Space Telescope. The Event Horizon Telescope is actually a network of eight radio dishes dotting the globe in high altitude sites, from the South Pole to Atacama, Chile, that together creates a virtual telescope the size of the planet Earth, explained Özel. The M87 black hole is one of two black holes EHT is working on—data from the other black hole, Sagittarius A* at the heart of the Milky Way galaxy, may be released later as the team continues to home in on its complexities. The image of the black hole’s shadow released today pushes our view of the universe, and brings us a step closer in understanding how these celestial bodies behave. “As with all great discoveries, this is just the beginning,” says Doeleman. Science Friday will be following the story as it develops this week. Tune in to Friday’s show for a live conversation with EHT team members and black hole scientists, and discover what this new data will mean for future research. Follow the news announcement of the image release on National Science Foundation’s special report. Play a round of Event Horizon Bingo during the announcement with special black hole bingo cards made by Science Friday! Hear Shep Doeleman describe the Event Horizon Telescope project and research on black hole M87 in a 2012 Science Friday interview.